Van Excellence should be applauded for raising such a range of issues. The most impressive thing about this year’s FTA Van Excellence Operational Briefings, which focused on driver physical and mental health and wellbeing, was not so much that the FTA was spending time and money promoting the subject, but the number of companies that had taken the time to come along and listen and learn how to better look after their drivers. The briefings took place over three days in Edinburgh, Derby and London, with more than 150 attendees packing out each event. The list of companies taking the time reads like a who’s who of best practise business leaders, with the likes of Murphy Plant, Amey Fleet Services, Cadent Gas and Balfour Beatty Plant & Fleet Services among the audience. The events were subtitled Van drivers – industrial athletes and, as someone who has run several marathons over the years, the topics were very similar to pre-race runner briefings. Nutrition, hydration, mental strength and resilience are all topics that will resonate with anyone who regularly takes part in sporting or endurance activities. But, van driving? Yet, as the day unfolded, it was easy to see why the parallels had been drawn. Multi-drop delivery work does require focus, concentration and stamina, particularly if you are carrying parcels or goods up flights of stairs. Working alone, often against tight deadlines in constantly changing urban traffic conditions, requires mental resilience and agility. Of course, as any manager knows, good staff are often a company’s biggest asset. Having healthy, well prepared and supported drivers can improve performance and productivity, contributing to a positive result on the bottom line. Van Excellence should be applauded for raising such a range of issues, but no less than the companies who hopefully will now go on to implement policies that will boost their driver health and wellbeing. Talking of taking the time to visit, the CV Show is almost upon us and the annual trip to Birmingham’s NEC looks set to be well worth the investment. Van Fleet World will be covering the event and we’ll have a stand in Hall 4 if you would like to drop by. We have a preview of some of the highlights in this issue and will follow up with a comprehensive round-up in the May issue. IN BRIEF Driver shortages With no Brexit outcome in sight, the FTA is still advising members to prepare for a No Deal scenario. However, with 11% of van drivers and 13% of truck drivers working in the UK coming from EU countries, policy manager Denise Beedell is warning of further driver shortages to come. She also comments that 90% of logistics workers will be under the governments required level of educational achievement, with 88% earning less than £30,000 per year, meaning that it will be harder for EU nationals to gain driving work in the UK. With that in mind the FTA continues to campaign for access to lower skilled workers. “We want the apprenticeship levy to be converted to a training levy, to include all vocation training,” said Beedell. Fleet management Mercedes-Benz Vans has opened an office in Leeds, in partnership with Mercedes-Benz Finance, to form a mobility partnership to keep customer businesses moving. Moving away from the Mercedes-Benz Trucks facility in Barnsley, the new office will deliver a range of services, including fleet management of customer vehicles. Reduced carbon Anglian Water has added 10 electric vans to its ﬂeet, in a bid to achieve carbon neutrality by 2050. The Nissan e-NV200s will be used by employees that carry out localised visits, though Anglian Water has installed charging points at a number of its sites. The company’s vans travel 22 million miles each year, with a diesel spend of £4.5m. See us at The Commercial Vehicle Show (NEC Birmingham) 30 April – 2 May 2019 on stand 5C40. Official Government Test Environmental Data. Fuel consumption figures mpg (litres/100km) and CO2 emissions (g/km). New Combo Cargo Van Range: Urban: 57.6 (4.9) – 64.2 (4.4), Extra-urban: 67.2 (4.2) – 72.4 (3.9), Combined: 62.7 (4.4) – 68.8 (4.3). CO2 emissions: 117 – 107g/km.# Model shown New Combo Cargo L1 Limited Edition Nav with offside sliding side-access door (optional at extra cost) and Night Blue metallic paint (no-cost option). #Fuel consumption data and CO2 emission data are determined using the WLTP test cycle, and the relevant values are translated back to allow the comparability into NEDC. The values do not take into account in particular use and driving conditions, equipment or options and may vary depending on the format of tyres. For more information contact your local Retailer. Vauxhall Motors Limited reserves the right to change, amend or withdraw this offer at any point in time. Correct at time of print (March 2019). Changing demands BT Fleet Solutions is having to adapt, to provide customers with an EV van offer. Head of engineering Gary Harrison talks VFW through the changes. handing the keys over and giving them a handbook. There is a change management and an educational piece associated with the driver as we move to an alternative fuel technology that we have never had to deal with before. And that’s not just the range anxiety, we need to consider how drivers operate the vehicle to make it perform most effectively, maintenance as well as driving experience. HOW DO YOU SEE THINGS DEVELOPING LONGER TERM? In the next 10 years, we expect to see a much larger selection of vehicles and specifically a larger range of 3.5 tonne panel vans – the one that a lot of our customers are waiting for. At that point we expect take up of EVs to accelerate. To some extent, that will depend on legislation and government subsidies, but I think there will be a substantially higher number of alternatively fuelled vehicles, with EV making up the highest percentage of that. At the end of the day, our task is to ensure our customers have the right vehicle at the lowest environmental impact that allows them to deliver the services to their customer, at the best price. If Euro 6 is the best for that operating environment, then Euro 6 will be the tool of choice. Also, whereas currently the standard fleet mix is 100% diesel, in 10 years’ time, I think the fuel source will be much more fragmented across the entire fleet. We will see EVs for certain operating environments and we will see CNG, LPG, hydrogen and anything new for others. Transit, Tailor-Made Following a record 2018, with 126,000 vans and pickups registered in the UK, Ford of Europe’s general manager for commercial vehicles, Hans Schep, tells VFW how the company is aiming to be one step ahead of an ever-changing market. OďŹ&#x192;cial fuel consumption figures in mpg for the New Ford Transit Custom range: urban 36.7- 39.8, extra urban 43.5 - 48.7, combined 39.8 - 44.8. OďŹ&#x192;cial CO2 emissions 163 - 182g/km. The mpg figures quoted are sourced from official EU-regulated test results (EU Regulation 715/2007 and 692/2008 as last amended), are provided for comparability purposes and may not reflect your actual driving experience. Information correct at time of going to print. 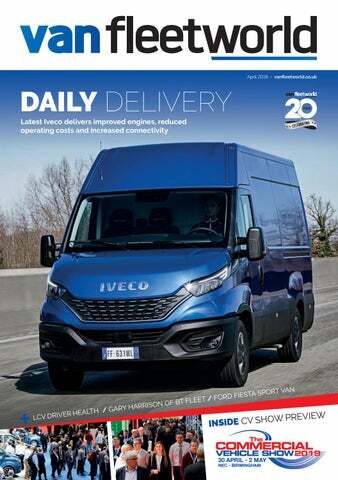 DAILY DELIVERY Iveco has updated its Daily van range with improved Euro 6D Temp/Euro VI engines, delivering reduced operating costs and increased connectivity, says Dan Gilkes. DRIVELINE The Daily continues to use a range of 2.3 and 3.0-litre diesel engines, now compliant with Euro 6D Temp (light duty) and Euro IV (heavy duty) emissions regulations. The 2.3-litre engines offer outputs of 116, 136 and 156bhp, while the 3.0-litre is offered with 160, 180 and 210bhp. The 3.0-litre engine is also available to run on compressed natural gas, where it delivers 136bhp. The vans continue with a six-speed manual or the Hi-Matic eight-speed automatic transmission. The introduction of electric power steering, an electronically controlled variable geometry turbo, super low rolling resistance eco tyres and standard Stop&Start on the 2.3-litre engines, have resulted in a claimed 10% improvement in fuel consumption in urban driving. Service and maintenance costs have also been cut by 10%, as service intervals move to 37,000 miles, from 32,000 miles on the previous model, thanks to a larger oil sump. INTERIOR The biggest changes to the van can be seen in the cab, where a new dash with TFT screen and central 7â&#x20AC;? monitor provides more information for the driver, with seven different menus of data. The Hi-Connect DAB infotainment system is both Apple and Android compatible and the central monitor can be used for a rear-view camera and with TomTom satnav. A 14mm smaller diameter steering wheel, with flat bottom for improved leg room, now comes with up to 20 integrated switches, while an electric parking brake improves cross-cab access and reduces effort for the driver. Electronic power assistance reduces steering effort, while a City Mode cuts steering effort by 70% for low speed manoeuvring. The steering column is now also adjustable for reach and rake. IN SUMMARY Daily retains a familiar appearance, yet Iveco has provided a host of detailed updates that lift the van to a new level of user friendliness, while cutting potential operating costs for customers. SAfetY ASSIStANCe The van has been restyled with a three-piece bumper for reduced crash repair costs. LED lights deliver a 15% improvement in visibility, with automatic high and low beam, should last the lifetime of the vehicle. Daily can be speciﬁed with a host of advanced driver assistance systems (ADAS). This includes Autonomous Emergency Braking, with City Brake Pro. This combination provides braking assistance at speeds as low as 5km/h and up to 80km/h. The vans can also be offered with Adaptive Cruise Control, Proactive Lane Keeping, Crosswind Assist and Queue Assist, which allows the vehicle to autonomously drive in low speed start and stop traﬃc. For drivers that tackle poor ground conditions, in construction and forestry for instance, there is the option of Hill Descent Control and Traction Plus, to deliver controlled driving on loose surfaces. Tyre pressure monitoring is available on single and twin wheel models. CoNNeCtIvItY The vans are offered with a connectivity box that provides remote diagnostics and remote assistance. Where customers have signed up to service and maintenance contracts, there is also the possibility of proactive contact from Iveco direct to the driver, to provide remote software updates and to book regular servicing. Iveco will also offer a range of tailor-made maintenance and finance options, to suit individual customers. Drivers and managers will be able to access data through a MyDaily app and a web portal, to monitor vehicle performance and driver style. A range of fleet management and telematic solutions will also be available. Iveco can also supply the telematic data for use with a customer’s third-party fleet management system. The connectivity box will be optional, with customers opting in to the many services on offer. of the event, the Commercial Vehicle Show 2019 will once again, incorporate separate Workshop and Cool zones, providing a shop window on these essential sectors of the distribution business. Van Fleet World will also be present, with a stand in Hall 4. These will certainly be plenty to see at the show and these are just some of the reasons to visit. on front-drive Transit and 80kg on the rear-driven models. The vans will also get selectable driving modes, including eco and towing. Options will include power side doors and active park assist, as the vans will be equipped with electronic power assistance for the steering for the ﬁrst time. Transit and Transit Custom models will also come with an embedded modem, providing access to a host of online monitoring and driver assistance applications. Custom also beneﬁts from the move to Euro 6.2 engines, with the new 185bhp rating replacing the previous 170bhp engine in Sport and Tourneo models. The vans will also get the selectable driving modes and the mild hybrid option, while Ford’s plug-in hybrid (PHEV) Custom will ﬁnally be offered to paying customers. Ford’s all-new Ranger pickup will make its ﬁrst public appearance at the show. Powered by a range of EcoBlue 2.0litre diesel engines, including a new bi-turbo model, the company has recently announced that it will also keep the existing 3.2-litre diesel engine alongside the 2.0-litre models. The Ranger line-up will be joined by the extreme Raptor model over the coming months. CITROËN Citroen is celebrating its 100th anniversary this year and the company will be sharing its biggest stand ever at the show with fellow PSA Groupe companies Peugeot and Vauxhall. The new Berlingo will take centre stage, backed by Dispatch and Relay. All Berlingo models will move to Euro 6.2 engines in May, along with Dispatch, with Relay making the engine change in June. The company will be promoting its service offering to customers, with news of changes to the Business Centre network. While all of the ﬁrm’s 145 dealers can sell and service vans, Citroen now has 41 Business Centres, offering an enhanced service to ﬂeet users. In addition, it has appointed 75 Business Active centres, that will offer additional support to business users without providing the full Business Centre service. Peugeot will have its full van line-up on display, including the award-winning Partner range, the mid-weight Expert and the larger Boxer. The company has been working with its 180-strong dealer network to bolster its 52 Business Centres, with the development of a network of Business Essential outlets. Though not offering the full Business Centre service, the Business Essential dealers will have LCV expertise and test vehicles on offer, as well as improved levels of after-care and service. The new British-built Vivaro will make its first appearance at the CV Show on the Vauxhall stand. Based on PSA siblings Citroen Dispatch and Peugeot Expert, the Vivaro will be offered in a range of wheelbases and load volume capacities. Set to be formally launched in June, the van will be offered in both light commercial and peoplecarrying formats. To prepare for both the new Vivaro and to accommodate the recently launched Combo, Vauxhall developed a network of 65 Van Business Centres. Each outlet will display the full range of Vauxhall LCVs, with test drive vehicles on offer. The company will employ national, allinclusive service pricing with overnight drop-off and pickup availability. VOLKSWAGEN Visitors to the Volkswagen stand will once again be made to feel at home, in the company’s ‘house’, where there will be a chance to relax on the sofa and discuss light commercial requirements with the team. The focus will be very much on new technology though, with electric versions of the eCaddy, e-Transporter and e-Crafter on display. The e-Caddy, which alongside the e-Transporter is built by partner ABT, will be the ﬁrst to arrive in right-hand drive this year, followed by e-Transporter in 2020 and e-Crafter in 2021. The company will also show a number of new conversions for the standard Crafter van, including a long-wheelbase CR50 riot van and a CR50-based high-roof minibus conversion, offering 17-seats. At the opposite end of the scale, VW will also demonstrate its commitment to accessible mobility, with wheelchair-accessible versions of the Caddy, Transporter and Caravelle. TOYOTA Toyota is extending its light commercial vehicle line with the launch of a car-derived compact model. The company will continue its cooperation with the PSA Groupe, basing its new model on the latest Peugeot Partner, Citroen Berlingo and Vauxhall Combo. That should mean short and long wheelbase models with payload of up to 1-tonne on either chassis. The new model will build on Toyota’s success with Proace, itself based on the mid-weight PSA van line. The company will also show some exterior speciﬁcation changes on the Hilux Invincible X model, increasing its range-topping status. MITSUBISHI Though Mitsubishi’s next generation L200 pickup will not be making an appearance in the UK until later this year, the company will have two new LCVs on offer in Birmingham. Both the Shogun Sport Commercial and the Outlander PHEV Commercial have recently been added to the ﬁrm’s line-up, offering customers a conventional diesel and a hybrid driveline in the 4x4 van market. In the run up to the show, Mitsubishi will also be running an online social media competition to design a truck of the future, with a show truck being built to display some of the winning ideas. Fiat Professional will once again be focused on trade customers, with each of the vans on its stand built to reﬂect a speciﬁc trade use. This will include a sandwich van, an ambulance and a painter and decorator’s vehicle. The stand will feature three Doblo Cargos, a Fiorino Sportivo, a Talento van and a Ducato with a tipper body. As one of the few heavy truck manufacturers to consistently exhibit at the show, DAF will have its largest display to date, across two stands, with a full line-up of vehicles. Yet, with no brand new models to show, much of the emphasis will be on customer support, including DAF Connect, an online fleet management system. The firm also offers a comprehensive range of maintenance and support packages to keep fleets on the road an ensure compliance. DAF Trucks will also be promoting a driver training voucher scheme. When acquiring new CF and XF trucks, retail customers’ drivers will be entitled to around 2.5 hours of professional driver training, through 25 dedicated DAF Dealer Driver Trainers. MAN TRUCK & BUS MAN Truck & Bus will offer customers a full line-up of commercial vehicles, from the 3.0-tonne TGE van to a 44tonne tractor unit on the stand at this year’s show. For van buyers, the TGE is the focus of interest, offered from 3.0-5.5 tonnes GVW, the TGE is of course based on parent company Volkswagen’s Crafter. This year MAN will offer the TGE as a minibus, based on the 5.0-tonne chassis and will also demonstrate a 3.5-tonne TGE Flatframe chassis cowl. Based on a front-wheel drive chassis, the Flatframe sits 190mm lower than the standard frame TGE chassis cab. It has been designed for specialist body builders to base conversions upon, such as low height Luton bodies and boxes. ISUZU Isuzu will base its display on the theme of award winning, as its D-Max pickup has indeed won 10 awards in the last 12 months. The D-Max line-up will include a variety of trim levels, along with an SSE branded working truck and a tipper conversion. strate the range of options available to customers. Moving up in size, VFS will demonstrate a 7.5-tonne tipping body from parent company Scattolini. Designed for vehicles like the Fuso Canter, the ﬁrm is also looking at Iveco’s Daily 7.2tonne chassis. Alongside its traditional dropside and tipper lines, the company will show a Luton body, equipped with a 500kg DEL tail lift. With an aluminium frame, the roof construction is a translucent GRP sheet, while the body sides and bulkhead are made from 33mm Foamcore composite panels. Specialist bodybuilder Cartwright Group will be launching a 3.5-tonne low ride rigid box van, for parcel delivery companies that is said to offer up to 15% more payload than competitive models. Flush rear doors have a slam-lock feature and there is a step in the bulkhead with hand poles to allow the operator to access the space over the cab. The body, which has been built onto a Movano chassis, comes with PIR controlled lighting. Cartwright will also show a 7.5-tonne box based on an Iveco EuroCargo NP, powered by compressed natural gas. Plus, the stand will feature a 13.6m curtainside trailer with redesigned cant rail for easier side loading and a doubledeck fridge trailer with a low height of 4.65m. Truckman has developed the RS-3 hardtop range with three lockable gull-wing doors, that will be available later this year for all leading pick-up truck bodies. The hardtop is ideal for engineers and technicians that require a mobile workshop facility with off-road capabilities. Available with an intelligent racking system, that can be accessed through the rear or gull-wing side doors, the RS-3 hardtop has the option of built-in electrical conduit, allowing installers to ﬁt additional lighting and alarms. The hardtop can be colour matched to the host vehicle or provided in an easy clean white ﬁnish. TEVO Racking specialist Tevo is to change its operating name to that of parent company Modul-System, though customers should not notice any other difference in operations. The company will have a number of updates on offer, including a lightweight workbench top that is made from the same material that the company uses for van ﬂooring. Weighing just 7kg, the new worktop will be considerably lighter than the current 19kg wooden surface. Modul-System has also developed a range of roof bars and lockable pipe tubes, to complement its racking lines. The roof accessories will use the vehicle manufacturer’s ﬁxing points, so there is no requirement to drill into van bodies. The company is also updating its Modul Connect plug and play wiring system. This will now incorporate wireless and Bluetooth activation for components. The system can also include a SIM card, to allow communication between the vehicle and its operating base. EDSTROM System Edstrom returns to this year’s CV Show with a Meet and Fleet Café, a dedicated refreshment area where ﬂeet professionals can meet and chat. The ﬁm’s latest racking products will be displayed on an electric Renault Kangoo Z.E. 33 van, where reduced component weight is said to improve potential payloads. The company will also demonstrate an onboard power system for electric and hybrid light commercials. Vehicle conversion company Ring Carnation is launching a new generation of vehicle power management. The Genisys II ECU system has increased processing power with a larger memory and greater control capability. In addition, the ﬁrm’s Wireless Switching Power Hub provides up to eight output ports with a total rating of 60A, making it easy to connect ancillary electrical items. The updated Power Hub can reduce the installation time on a typical installation of a light bar, two working lamps, three interior lights and a hand wash from three to two hours. The Thermo King and Frigoblock divisions of Ingersoll-Rand will be present at the show, displaying a range of temperature-control solutions for future low and zero-emissions vehicles. The display will include the E-200 all-electric refrigeration unit for vans and trucks below 3.5-tonnes. A new controller allows the refrigeration unit to adapt its capacity based on the actual need and available power. When equipped with an optional TK battery, the controller manages different power sources at the same time. Thermo King will also be promoting its connectivity and telematic capabilities, that improve customer uptime, operational efficiency and can contribute to proactive predictive maintenance. LABCRAFT LED lighting ﬁrm Labcraft will present three of its lighting solutions this year. Banksman BM3 is a Regulation 23-compliant manoeuvring lamp that can be mounted at various points on the underside of the chassis. It can be set to work when reversing or when travelling forwards at speeds up to 6.4mph. Vanlite is direct replacement for OEM workspace lighting within vans. The LED light is seven times brighter than conventional interior lighting and plugs directly into the OEM lighting apertures, making it quick and easy to install. Si9 Scenelite if the ﬁrm’s ﬁrst scene light, for use on a wide range of applications, such as tail-lifts and on utility vans and rescue vehicles. COOLKIT Temperaturecontrolled bodybuilder CoolKit will base its stand around the latest VW Crafter equipped with a dual-temperature conversion capable of carrying frozen and chilled goods. The vehicle has a moveable lightweight bulkhead, providing ﬂexibility of compartment size, even permitting the full cargo area to be used for frozen or chilled. The body features CoolKit’s CurtAir system on both side and rear doors, creating an effective climate separation between the inner temperature and the outside, ambient temperature. The company also claims that weight savings throughout the build have resulted in payload improvements of up to 150kg, depending on van make and model. Auto power systems supplier Mastervolt will make its ﬁrst appearance at the show this year, with parent company Power Products (Mobile Solutions). The company will show a range of batteries, inverters, power systems, chargers and monitoring equipment, based on a Volkswagen Crafter chassis. Van Guard will be launching a number of vehicle security and loading systems at the show, including the Van Guard Ladder Loading System and a quick release ladder clamping solution. The company will also bring a range of trade van racking options, roof bars and roof rack storage systems. SAFETY AND COMPLIANCE AXTEC Axle weighing company Axtec has updated its OnBoard Axle Load Indicator system. Suitable for all commercial vehicles, from light vans to 44-tonne trucks, the revised system comes with a choice of 5” or 7” touchscreen displays, providing a clearer graphic. All management functions are password-protected and there are no manual controls for drivers, to ensure failsafe protection from overloading. The new screens use less power than previous models and now provide outputs to tracking systems and other telematic devices. Options include remote calibration, video recording and analysis of vehicle data. Vehicle Weighing Solutions is launching VWS Live, a smart data system to provide customers with immediate access to weight, alerts and location data. The company will also have its Vehicle Overload Protection System VOPS2 on the stand. VOPS2 can be installed on most commercial vehicles from 3.5-tonnes upwards. 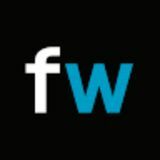 SmartWitness will launch three new and upgraded video telematic solutions this year – SmartView, SmartGuard and SmartAPI. SmartView is a video tracking ﬂeet software system that provides instant HD video on demand from all cameras on the vehicle. Maps show where the ﬂeet is at any time and managers can track routes taken. SmartGuard is a full service software package upgraded this year with driver league tables, that can be used as a virtual ﬂeet manager. It can be used to simplify the vast amounts of data available to ﬂeet managers into simple to use league tables. Smart API is an application that allows traditional telematics providers to add video to their own systems. The system has already been adopted by CMS Supatrak. TRAKM8 Trakm8 has unveiled a mobile app for ﬂeet managers using its Trakm8 Prime solution. The Trakm8 Prime Fleet Manager app delivers important insights into driver behaviour and vehicle condition. The launch follows a recent move to 30-day rolling contracts, providing companies with increased ﬂexibility. The company has also updated its RH600 in-cab camera system to include driver concentration alerts. ECCO SAFETY GROUP ECCO Safety Group will participate at the show under its own name for the ﬁrst time this year. The Group, which owns Britax, Vision Alert and Premier Hazard, will offer a range of safety solutions for ﬂeet vehicles, in sound, vision and lighting areas. the most sophisticated drawer system Maximise the interior load space of your van with our lightweight, ultra-strong, customisable system. from the UK’s No1 tool storage brand The ultimate in versatility, with stackable, secure modules to keep everything organised in your vehicle. Available in three different sizes and multiple configurations. VISIONTRACK VisionTrack will show an enhanced advanced driver assistance system (ADAS) solution and an extended range of forward and rear-facing cameras for LCVs. The connected ADAS system combines a forward-facing camera with an in-vehicle fatigue and distraction monitor, driver feedback device and HD mobile digital video recorder. The ADAS camera identiﬁes lane departure forward collisions, tailgating and vulnerable pedestrians or cyclists, while the in-vehicle camera can identify a tired or distracted driver. The driver can be alerted to potential dangers and oﬃce-based managers can monitor areas of concern both in real-time and historically. WORKSHOP AND LEASING YOKOHAMA Tyre manufacturer Yokohama will make its ﬁrst appearance at this year’s show, with a full range of premium van, 4x4 and high-performance tyres. The company is pushing into the van market and has recently won a number of LCV ﬂeet deals, from companies including Comet Car Hire and European logistics ﬁrm X One Wholesale. SELSIA FLEETCHECK FleetCheck has updated its Vehicle Inspection app, which is currently used to carry out more than 3,000 vehicle checks in the UK each day. The app now includes access to tyre pressure data for a wide range of vans. It delivers a paper-free vehicle check process, including uploading relevant photos from drivers and bespoke checks for specialist equipment. BT FLEET SOLUTIONS BT Fleet Solutions will be promoting a range of apps and systems that can make life easier for van drivers and ﬂeet managers. From daily checks to MOT and service alerts, defect notiﬁcation to pre-booking of repairs, the BT Fleet Solutions app, offers a complete operational support structure, to reduce downtime and boost operational proﬁtability. TRUTAC Tachograph and compliance provider TruTac has updated its TruLicence system, to make it easier for ﬂeet managers to verify driver licence and tachograph data. Key features include online driving licence checks, validation of correct information, current endorsements and points, entitlement to drive, conﬁrmation of vehicle categories and checks against disqualiﬁed drivers. VDO Tachograph specialist VDO, part of Continental, will be hosting a range of free seminars in the Workshop area of the show. Lastly one hour, the seminars will cover Smart Tachographs and Future Technology Within the Transport World. The aim is to provide a brief introduction to the changes within the transport industry with new tachograph legislation and to outline Continental’s future innovations. Selsia will showcase its centrally managed multi-site accident repair network and the beneﬁts that it can bring to van ﬂeets. The company works to take over the hassle and complication of managing accident repairs, no matter how large or diverse the ﬂeet. With more than 200 approved accident repair centres across the UK and the Republic of Ireland, Selsia works to keep repair costs down, while minimising vehicle loss of use. LEASEPLAN With over 65,000 commercial vehicles on its ﬂeet, LeasePlan will be communicating four major messages at the show this year. This will include a focus on electric light commercial vehicles, looking at the challenges and opportunities that ﬂeets face. The perennial question of whether to lease or to purchase will also be addressed, while the company will also look at ways in which customers can improve operating eﬃciency through better management of their vehicles. Lastly, safety and compliance will be a tackled, with LeasePlan one of the ﬁrst leasing companies to be fully accredited by FORS as a ﬂeet vehicle provider. This can help particularly smaller companies to achieve the FORS Bronze, Silver and Gold standards of operation, by providing a telematic paper trail. Representative from both FORS and electric charging provider Chargemaster will be available on the stand to answer customer questions and to provide advice to potential leasing users. LeasePlan has launched its own internal CV Academy. All employees within the company now have to be at least at the bronze level of LCV awareness, with those regularly involved in the LCV market achieving the higher Silver and Gold standards. RHA The Road Haulage Association (RHA), one of the three CV Show partner organisations, is celebrating its 75th Anniversary at this year’s event. Visitors to the stand will be able to take a trip down memory lane, to see how the industry has changed and the impact that the Association has had since its start in 1944. There will also be a helpdesk facility, providing the opportunity to have one-to-one discussions with experts on a range of issues. The showroom for excellence One event. Three days. Build your industry knowledge at The Commercial Vehicle Show 2019 in an interactive way. Explore the latest products and developments in the show halls and discover the dedicated Cool and Workshop zones. The Commercial Vehicle Show 2019 is the showroom for excellence, providing an ideal opportunity to network and engage. Visit us at the NEC Birmingham, Tuesday 30th April – Thursday 2nd May 2019. Ford Fiesta Sport Van Rumours of the Fiesta Van’s demise have been greatly exaggerated, says Dan Gilkes. It’s not often that you can say that a van is back by popular demand. However, after Ford announced that it would no longer be building the Fiesta Van, a number of customers apparently made it clear that there was still a demand for the carderived model. At last year’s CV Show, Ford therefore announced the return of the Fiesta Van, based on the latest Fiesta car body. Available in range-topping Fiesta Sport Van trim only, the compact Ford is now powered by a choice of a 1.5-litre diesel engine or the 1.0-litre EcoBoost petrol motor. The diesel delivers a punchy 120bhp with 270Nm of torque, while the petrol engine puts out 125bhp with 170Nm. That power is delivered to the front wheels through a six-speed manual gearbox and, in the diesel at least, delivers a truly entertaining drive. The Fiesta Sport Van uses a threedoor car body with a steel and mesh bulkhead behind the front occupants and a flat load floor that offers just under 1.0m3 of volume. You can carry half a tonne, which should be more than enough for most buyers, who opt for the Fiesta more for its ease of use and car dimensions than its LCV capabilities. bility, with a firm ride the only slight downside. As mentioned though, the Fiesta Van is a delight to drive. Little wonder then, that it is still very much in demand. THE VERDICT With no obvious competition, the Fiesta Sport Van should tick all of the boxes for loyal fans. Promote your company here and online for just £400/year.